Advantages: Compact and useful format for modellers; packed with helpfully captioned photos; inspiring colour profiles; attractive cover art - front and back; supporting narrative text; nice to see popular titles being re-released. Squadron/Signal publications has re-released two more of their older titles. Both of these books follow Squadron/Signal’s popular “In Action” format with Don Greer cover art, colour profiles as a “centrefold”, helpful line drawings and specifications spread over 50 pages in landscape format. As with the rest of the series, the real backbone of these books are the multitude of contemporary photographs packed between the covers. These photos are captioned in detail. These books were originally released in 1985 and 1986. They have been unavailable for some time now. This book will be especially helpful to anyone building Hasegawa's 1/72 scale kit, or Revell's new reboxing as the -7 variant (also available from Squadron.com). Around 100 captioned photos are supported by plenty of line drawings covering details, ordnance and variants; plus descriptive text. Ten "centrefold" colour profiles and two colour plates on the rear cover provide ample inspiration for modellers. Service history and variants are only covered to the mid-1980s due to the original publication date. The Neptune continues to serve to the present day, so this will be a limitation for modellers depicting an aircraft from the last fifteen years. This is an especially timely reissue with Classic Airframes' trimotor 1/48 scale S.79 due for release sometime in 2002. Once again, 100 photos are supported by line drawings and colour profiles. 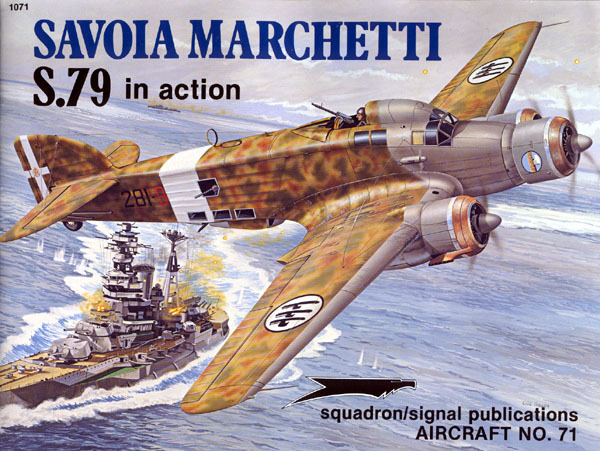 There is a terrific range of Italian schemes in the colour section - browns, greens, sand and greys - to keep the modeller happy. These books will not provide a total operational and technical history of these important maritime aircraft, but they do represent an inexpensive primer on the subjects. The original issue of these three titles date back to the mid 1980s, but they are still relevant and helpful today even though the Neptune book is missing a chunk of modern history. It is nice to see these inexpensive books widely available again. Their “In Action” format will be especially valuable to modellers.